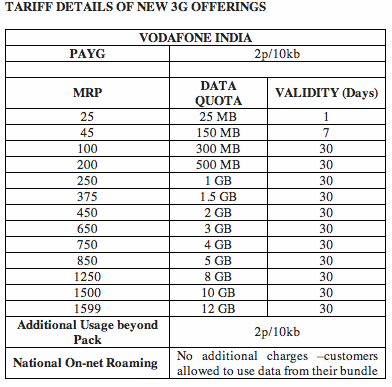 Vodafone today announces its new affordable 3G tariff all over India.These data plans start from Rs. 25 for 25 MB data usage and go up to Rs. 1599 for 12 GB of data usage. For any usage beyond the stipulated data usage on each plan, the customers will be charged at the rate of 2p/10kb.